These delicious and easy Air Fryer Steak Kebabs are made in your Air Fryer with little effort. Marinated steak and delicious air fried vegetables make this air fryer recipe a family favorite. This post may contain affiliate links, my full disclosure can be found here. It’s cold outside but I still get to make air fryer steak kebabs without using an outdoor grill. Thanks to my Air Fryer, I get to have kebabs year round. My favorite type of kebab are these steak kebabs. Steak in the air fryer is an all time favorite of mine so steak kebabs just seemed appropriate. Can you make steak in an Air Fryer? Yes, yes, and yes. This Perfect Air Fryer Steak recipe is one of our favorite ways to prepare steak. Following the same methods I used in that recipe, I was able to prepare perfect steak kebabs/skewers. How to make steak kebabs/skewers in an Air Fryer? First, you’ll start by marinating your steak. I use sirloin steak that has been cut into 1 inch cubes. I try my hardest to make sure all the steak is about the same size so it cooks evenly. 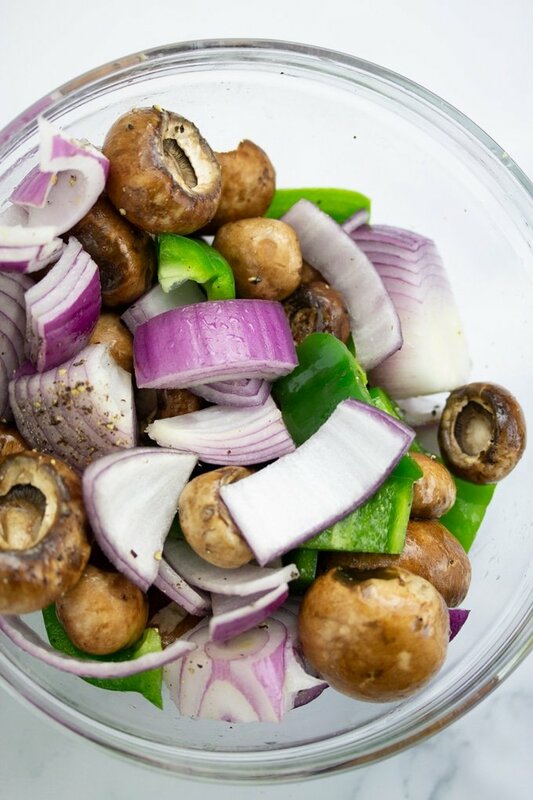 Then you will prepare your vegetables by chopping your onions, peppers, and cleaning those super dirty mushrooms. I then toss them in a bowl with some olive oil and I sprinkle a little bit of salt and fresh cracked black pepper over them. Once the meat and vegetables are placed on your skewers, place them in your preheated Air Fryer of 390 degrees Fahrenheit. I usually can fit about 6 kebabs on my Air Fryer. I cook my kebabs for 12 minutes, flipping them halfway through. 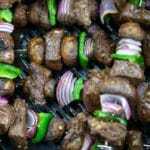 What is the best meat and vegetables to use for my kebabs? I suggest using top sirloin for these steak kebabs. It’s a cheaper cut but stays juicy after marinating and air frying. 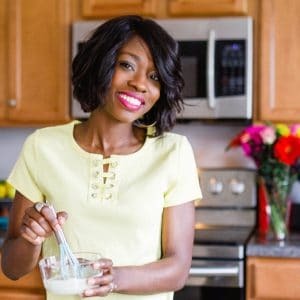 For the vegetables, I’ve included my favorites in this recipe but you could definetly sub for your favorites. I’m thinking zucchini, pearl onions, and colored bell peppers would be great. 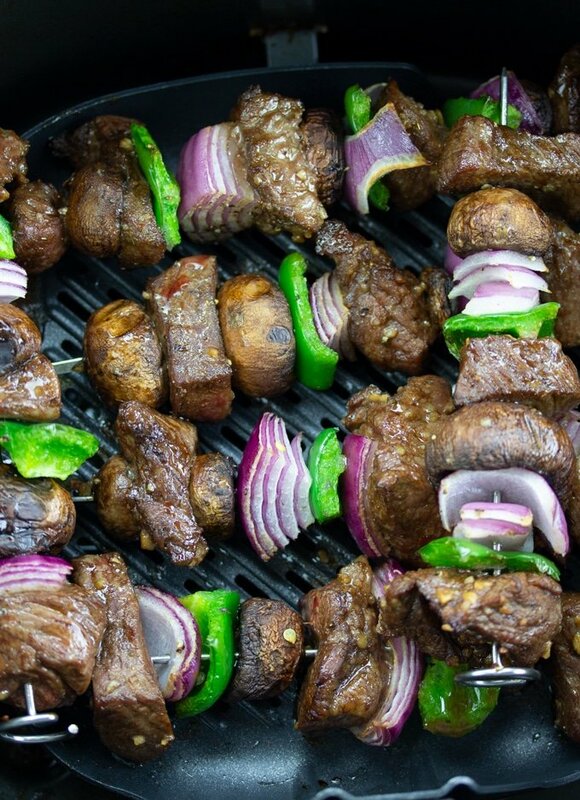 I hope you enjoy this Air Fryer Steak Kebab recipe as much as we do. Until next time. These Air Fryer Steak Kebabs are a quick and easy delicious meal. No need for an outdoor grill when making these skewers. The steak is marinated in a delicious sauce and the vegetables are air fried to perfection. 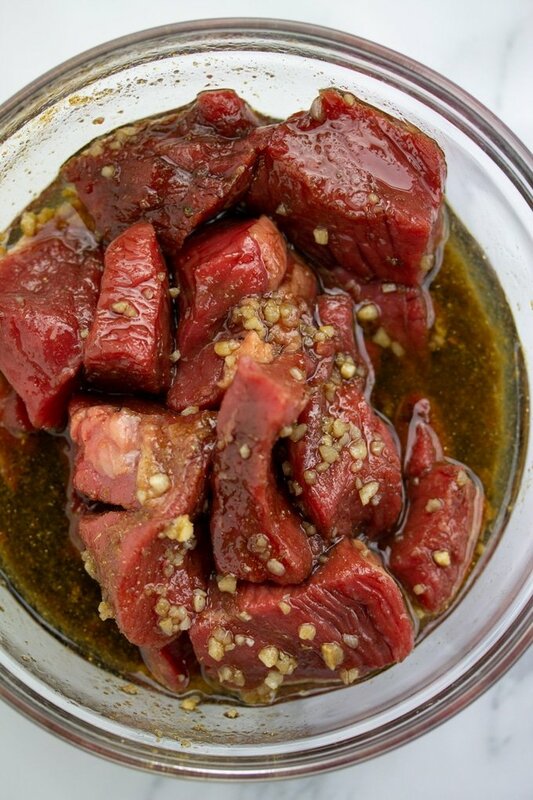 Combine steak, olive oil, soy sauce, garlic, cumin, salt and black pepper. Allow to marinate for 30 minutes. 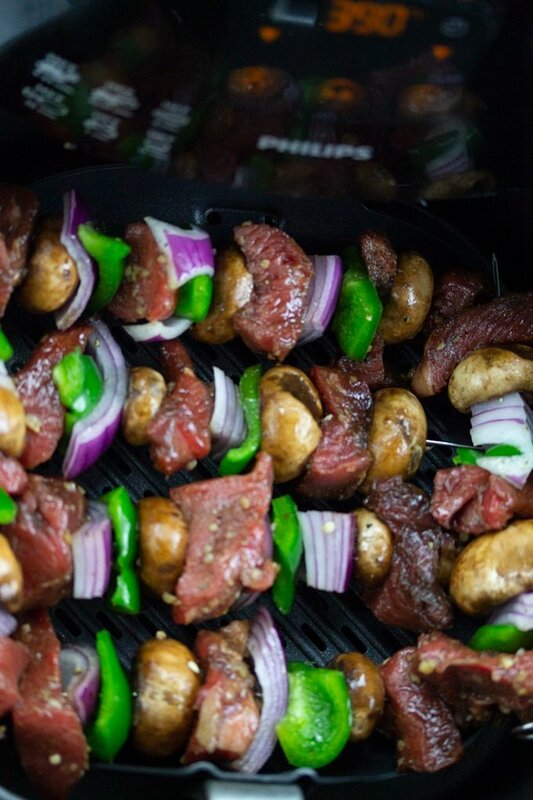 Place marinated meat, baby bella mushrooms, green pepper, and red onion on skewers. Preheat air fryer to 390 degrees Fahrenheit. Once preheated, place skewers inside of Air fryer. Cook for 10-12 minutes, flipping halfway.